Francesca Valente is a cultural mediator and art curator. 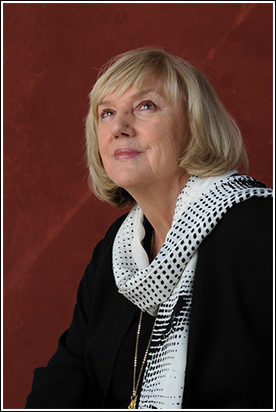 For over 30 years she brought the best of Italian culture to North America as director of the Italian Cultural Institutes (IIC) of San Francisco, Toronto, Vancouver, Chicago and Los Angeles. A passionate promoter of Italian architecture and design as well as modern and contemporary art, she curated exhibitions of Lucio Fontana, Marino Marini, Carla Accardi, Alighiero Boetti, Sandro Chia, Enzo Cucchi, Michael Snow and Lawrence Wiener, Nunzio, Luigi Ontani, Mimmo Paladino, Giuseppe Penone, Michelangelo Pistoletto, Remo Salvadori, Emilio Vedova, in collaboration with major Italian and North American museums. She conceived and organized the acclaimed Leonardo da Vinci e Bill Viola exhibition, served as the project director of The Fountain of Italy by Enzo Cucchi in Toronto, and organized meetings with the most important art critics such as Achille Bonito Oliva, Germano Celant and Bruno Corà. For three years, while posted in Rome, she was responsible for the Culture and Heritage Department at UNESCO National Commission for Italy, co-curated the collection of contemporary art of La Farnesina (the headquarters of the Italian Ministry of Foreign Affairs), and was appointed as the cultural liaison between the Ministry itself and the City of Venice. In 2011 she coordinated all the 89 Italian Cultural Institutes in the world for the Italian Pavilion, Venice Biennale. At present, she is curating an exhibition accompanied by a trilingual catalogue of 215 artists from Central-Eastern Canada for Imago Mundi, Benetton Foundation.